Read the label when buying dried pasta – The best pasta is made of 100% semolina (the label will say durum – wheat semolina or semolia). Pasta made from durum wheat retain their shape and firmness while cooking. When cooked properly they do not get mushy or sticky. Pasta that are not made with semolina produce a softer noodle and will not hold up well when tossing. Use these pastas for casserole-style dishes. Check out Linda’s delicious Pasta, Rice and Main Dish Recipes. Most dried pasta doubles in volume when cooked. For accuracy, measure pasta by weight rather than by cup. Cooked pasta can be measured by volume. The general rule is one pound of dry pasta or freshly made pasta will serve six as an appetizer or four as a main course. Remember – Shapes may vary in size according to the manufacturer, so use these measurements as generalizations. The easiest way to measure pasta is to use your digital scale. 4 ounces of uncooked pasta (elbow macaroni, shells, rotini, cavatelli, wheels, penne, or ziti) = 1 cup dried pasta = 2 1/2 cups cooked pasta. 4 ounces of uncooked pasta (spaghetti, angel hair, vermicelli, fettuccine or linguine) = a 1-inch diameter bunch of dry pasta = 2 cups cooked pasta. Using plenty of water helps to prevent pasta from sticking together by quickly washing away the exuded starch. If your water contains any impurities, it will taint the finished flavor of the pasta. Filter your home water if possible. Fill that big pot 3/4 full of COLD water or use at least one quart of cold water for every four ounces of dry pasta. Four quarts is a bare minimum per 12-ounce package of pasta, six to eight quarts is ideal. The reason for this is that hot water will dissolve anything (including contaminants like lead) much more easily than cold water and if that water encounters something like an older leaded pipe or some rust before coming out in your kitchen sink, it could very well end up in your glass. The most common problem is water that has been sitting in your home pipes for over 6 hours. Add plenty of salt, about 2 tablespoons of kosher (coarse) salt per pound of pasta. This may seem like a lot, but it is necessary for getting the pasta properly seasoned. Plus, most of the salt drains off with the water. If you taste the salted water, it should resemble “sea water.” NOTE: If you are on a sodium restricted diet, please follow your doctor’s orders before adding salt. Do NOT add oil of any kind. Oil has the unwanted effect of coating the pasta and making it slick so the sauce will not stick to it. Explanation or Science of Boiling Water: Pasta added to water before it starts to boil gets a heat start on mushiness. Pasta quickly begins to break down in tepid water as the starch dissolves. You need the intense heat of boiling water to “set” the outside of the pasta, which prevents the pasta from sticking together. That is why the fast boil is so important; the water temperature drops when you add the pasta, but if you have a fast boil, the water will still be hot enough for the pasta to cook properly. Cook the pasta, uncovered, at a fast boil. NOTE: Once you have added your pasta, do not cover the pot with a lid. You can regulate the heat so the pasta/water mixture does not foam up and over the pot sides. Lower it the tiniest bit, and everything should be under control. Do not rely on the package to give you the correct cooking time (this is only a guideline). Start timing when the water returns to a boil. Most pastas cook in 8 to 12 minutes. Test dry pasta for doneness after about 4 minutes of cooking by tasting it. It is difficult to give exact cooking times since different shapes andthickness of pasta will take less or more time to cook. Do NOT rinse unless the recipe says to do so. The starch that makes the pasta stick to itself also helps the sauce stick to the pasta. If you are going to toss the pasta with the sauce immediately, sticking should not be a problem. Important: Once your pasta is ready, turn off the heat and scoop out 1 cup of pasta cooking water and set aside. This reserved pasta water contains essential starch that can be used later to adjust the consistency of your sauce, from thickening it to thinning it. This soupy looking water you used to throw down the drain is actually a miracle ingredient! Never over sauce pasta. Italians complain that Americans drown their pasta in too much sauce. The Italians way is to toss pasta with just enough sauce to coat it without leaving a big puddle on the bottom of the plate. Warming A Serving Bowl: Pour some hot water into it and let stand until ready to use. Then pour out the water and dry the bowl. Warm plates by putting theminto a 250 degree F. oven for 10 to 15 minutes just before serving. Reheating Pasta: Microwave the pasta in the storage container on HIGH for 1 to 3 minutes, tossing the pasta halfway through. The length of time in the microwave depends on how much pasta you have. You can also reheat the pasta by putting it in a colander and running very hot water over it. Be sure to drain the pasta well before putting on sauce. Making Pasta Ahead: Cook the pasta as usual, being particularly careful to cook it only until al dente. Drain, rinse under cold running waterto stop the cooking, and again drain thoroughly. Let pasta cool completely, then toss with a couple of teaspoons of oil so it will not stick together. Pasta can be stored in a plastic bag or in a covered bowl in the refrigerator for up to three days. 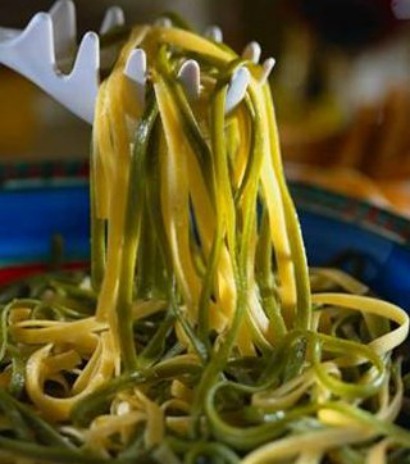 The perfect method for eating spaghetti or other long stringy pasta is to twirl it around your fork. Use a spoon to help if needed. It is also acceptable to cut pasta with a knife and fork. You can get some leverage by turning the pasta while holding the tines of your fork against the edge of your plate. It is even correct to neatly cut the pasta if twirling is too hard. What is undeniably bad manners is slurping in a mouthful of trailing pasta without benefit of twirl or knife. It is often loud, and it is never pretty. If possible, serve warm pasta in warm, shallow bowls instead of on dinner plates. The sides of the bowl aids in turning pasta noodles on the fork. During the 18th and 19th centuries, the ordinary people ate spaghetti with their hand. When the fork was invented, pasta became food fit for royalty as well, because they could now eat it without a loss of dignity. The Italians say that a character of a man can be determined by the way he eats spaghetti. Check out Restaurant and Dinner Party Manners and Etiquette: Dining Etiquette Guide. Table manners play an important part in making a favorable impression. They are visible signals of the state of our manners and therefore are essential to professional success. The point of etiquette rules is to make you feel comfortable, not uncomfortable. Thanks, the proper way to make my dish is right here. I’ve been cooking for my parents and helping them out, and want to step up my skills. This guide on how to make noodles, because it is for general noodles, helps immensely with providing a better tasting and in turn more nutritional meal plan. Please keep up the excellent work!